Available in capacities from 1500 kg to 5000 kg. The model load cell 619 belongs to the S type group of load cells. Transducers of this type are symmetrical and have threaded holes top and bottom to introduce the load which can either be in tension or compression. The 619 is constructed from plated alloy steel and is sealed to IP67. Capacities range from 1500 kg to 5000 kg. Because of their good dynamic performance and their symmetrical design,S-shaped load cells also very often used as a force transducer. 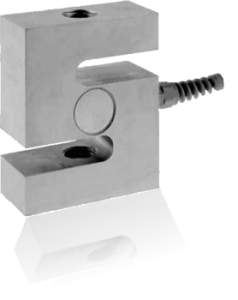 Because of its compact design the S type load cell can be manufactured cost effectively and offers a real alternative to the traditional more expensive force transducers. The 619 load cell is fitted with a 6 core shielded cable as standard. Special cables and lengths are available on request.